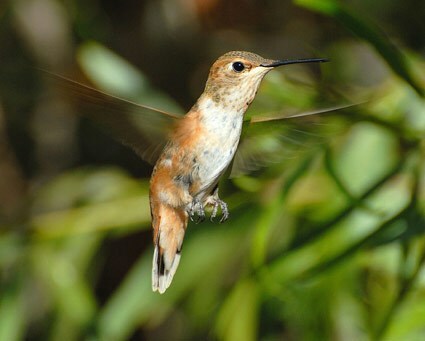 Rufous Hummingbird is one of the most tenacious and belligerent among the hummingbird species found in North America. The primary targets of their belligerence are flowers and feeders; they are known to aggressively chase even after the larger hummingbirds of Southwestern America. Size: This is a small species, measuring 7-9 cm (2.8-3.5 in). Weight: Their weight ranges between 2 and 5gm (0.071-0.176 oz). Plumage: The rufous face, which earns them their name, is followed, in the males, by a bright reddish-orange throat patch which, in the favorable light, looks like a brilliant burning coal. In the case of females, there are some white, green and iridescent orange feathers at the center of the throat, while it has a dark tail with white tips with a rufous base. 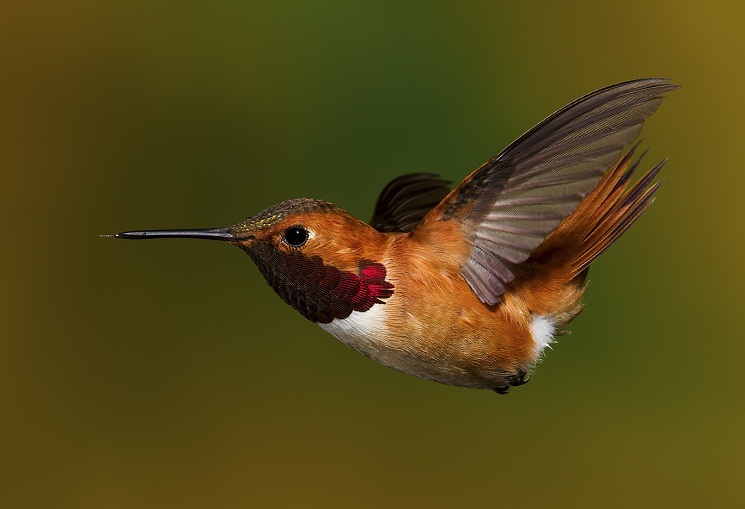 Wingspan: When fully stretched, the rufous hummingbird’s wings measure 11 cm (4.3 in). Bill: The bill of this bird is long, straight and slim. 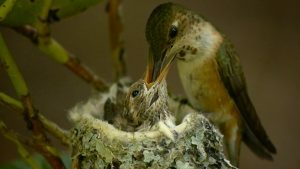 Most hummingbird species do not live for more than a year but if they do survive that juvenile year, their life expectancy goes up exponentially. The oldest recorded rufous hummingbird is believed to have lived for 8 years 11 months. 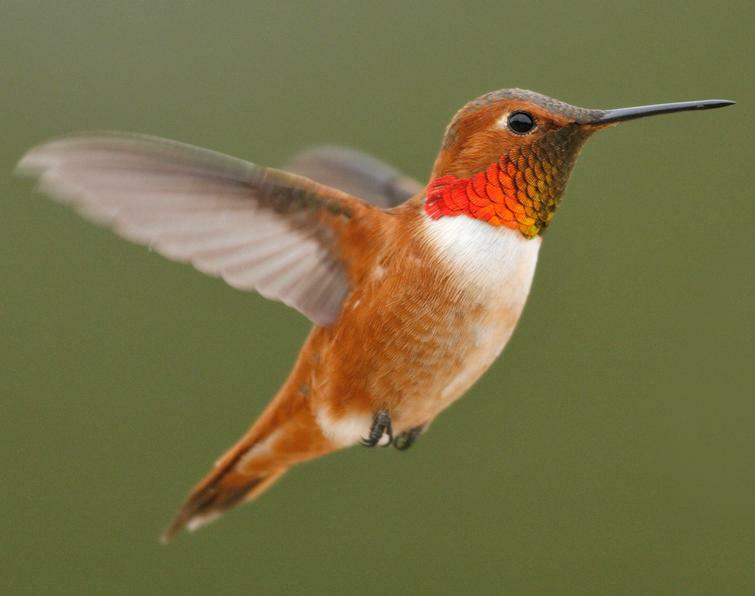 Rufous hummingbirds are migratory species. They migrate through the Rocky Mountains and its nearby lowlands between May and September to take advantage of the wildflower season. 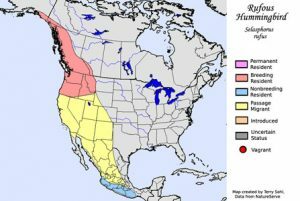 Their migration range has a clockwise pattern, with individuals moving south along the two sides of the Great Basin Desert, and then north again on a westerly route along the Pacific coast. These birds are being found out of their normal range more often in recent times, in places like the southeast and even northeast of the United States and Canada; this is because of their attraction to artificial feeders which are placed in these regions during autumn and winter. They have even been seen in the Bahamas and Turks and Caicos Islands. Rufous hummingbirds breed in open and shrubby areas, yards, parks, forest openings and sometimes in the forest itself, also in thickets, swamps, and meadows, from sea level up to a height of about 6000 feet. During migration, they live in mountain meadows up to 12,600 feet. 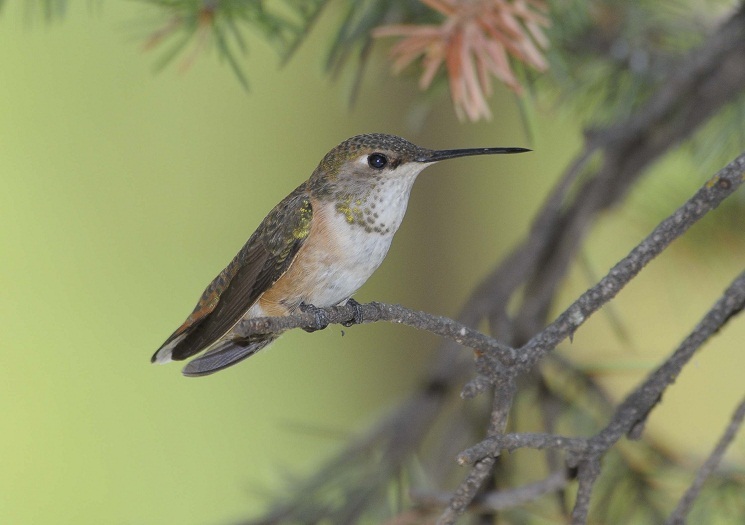 When in Mexico, the rufous hummingbird lives in oak, pine and juniper trees at 7,500 to 10,000 feet of elevation. Rufous hummingbirds, like other hummers, hover at flowers to sip the nectar, and when finished with one, they fly to another in straight lines, at a fast speed. Both male and female rufous hummingbirds are extremely territorial. When they are not feeding, they perch nearby, and if they spot another hummingbird approaching, they launch themselves for a dive attack on the visitor. A male individual may chase off a female from a feeder, even during their mating season. When they stopover somewhere during their migration, they defend that territory judiciously. At being agitated, they fan their tails out and chirp, while the males also exhibit their iridescent throat gorgets. Males have been seen to perform a steep oval or J-shaped courtship flight if a female enters their breeding territory, and once the female perches, the male switches to low and horizontal figure-8s. The rufous hummingbird’s vocalization is a rather hard ticking sound, like tic-tic, sometimes these double tics are trebled, ch-ti-tik. When alarmed they give out a slightly squeaky buzz, tsirrrrr. The wings of an adult male often draw attention, owing to the buzzing sound that it generates. 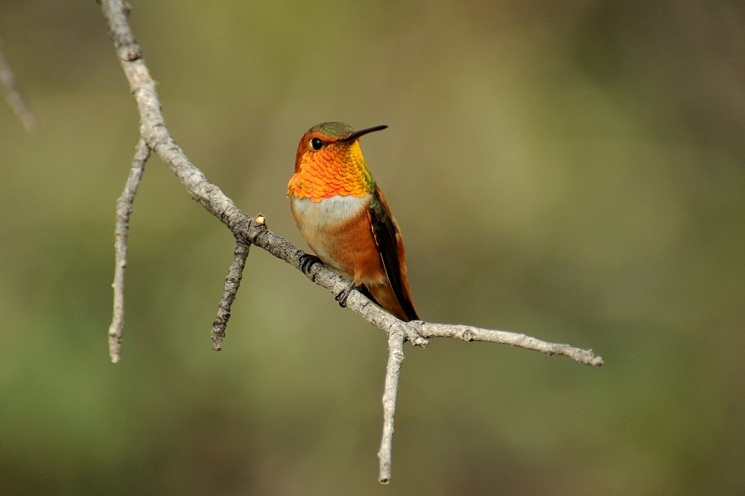 Like all hummingbirds, the rufous hummingbird gets most of its nutrients from sipping on flower nectar. You may also sometimes see an individual picking an insect out of the air, as insects are a source of proteins and fats for them. Flowers that they go for are columbine, scarlet gilia, penstemon, Indian paintbrush, lilies, and mints. Insects like gnats, midges, and flies also catch the rufous hummingbird’s fancy and regularly become a part of its diet. 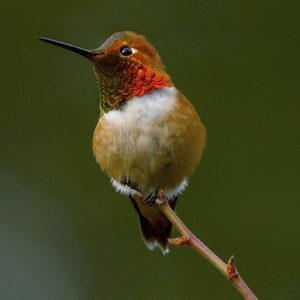 Due to their tremendous physical exertion when flapping their wings, whether for flying or hovering, the heart of the rufous hummingbird beats at 1,250 beats per minute. This happens so that blood is rapidly circulated throughout its extremities, however, at rest, the bird can slow down its heart rate down to 250 beats per minute. 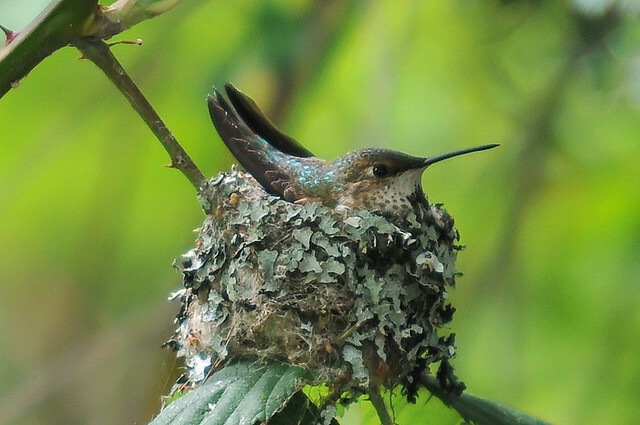 The lungs of all hummingbird species serve two purposes of delivering oxygen to the bloodstream and also to help cool the bird when it is perched. The pectoralis majors muscle that helps the rufous hummingbird in flight, is made up almost entirely of type-I, fast-twitch muscle fibers, allowing the wings to beat up to 52-62 beats per second. 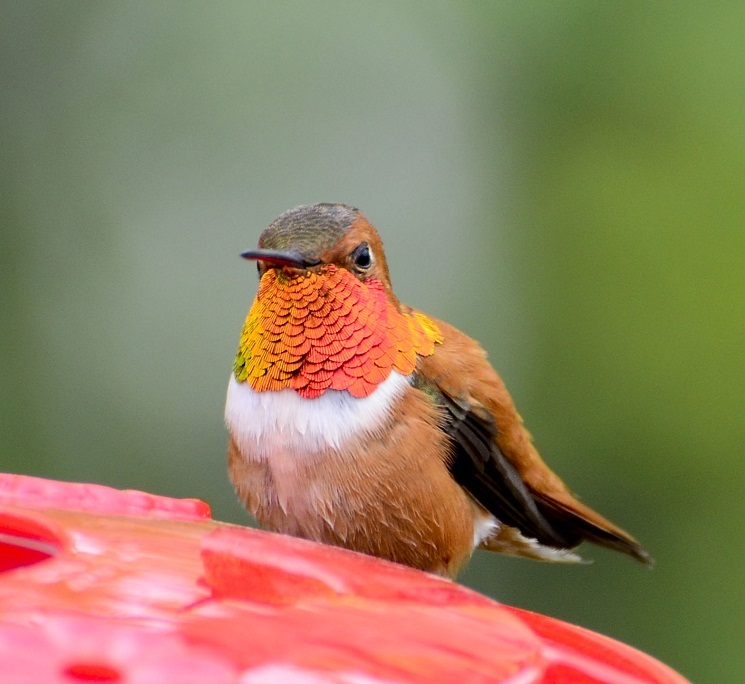 Rufous Hummingbirds have adapted themselves to survive in very low temperatures and scarce food; they achieve this by reducing their metabolism and body temperature in a state called torpor. A rufous hummingbird’s normal body temperature is 105°F; during torpor, the body temperature plummets down to 70°F and stays thereabouts until conditions improve. In the wild, one of the most potent threats to the rufous hummingbird are snakes that live in the same trees where the birds nest and sleep. Poisonous spiders may sometimes inject the bird with a venom that immobilizes the bird. Being small in size, getting stung by a bee or a wasp may sometimes be fatal as well. 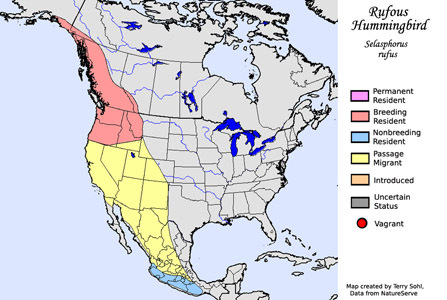 An unlikely threat to the rufous hummingbird could be domestic cats. Feeders are put up for the birds in houses, and any house that has a pet cat may turn out life-threatening for the birds, as cats have a tendency to sneak up and go for the kill, on the birds while they are at the feeder and are distracted by it. To prevent this, feeders should be hung at a safe height where the cat’s jump cannot reach. The species have been rated 13/20 on the Continental Concern Score. They are listed as a ‘Least Concern’ species in the IUCN Red List. All females of this species and a few rare green-backed males are extremely difficult to be distinguished from Allen’s hummingbird due to the similarities in their appearance. 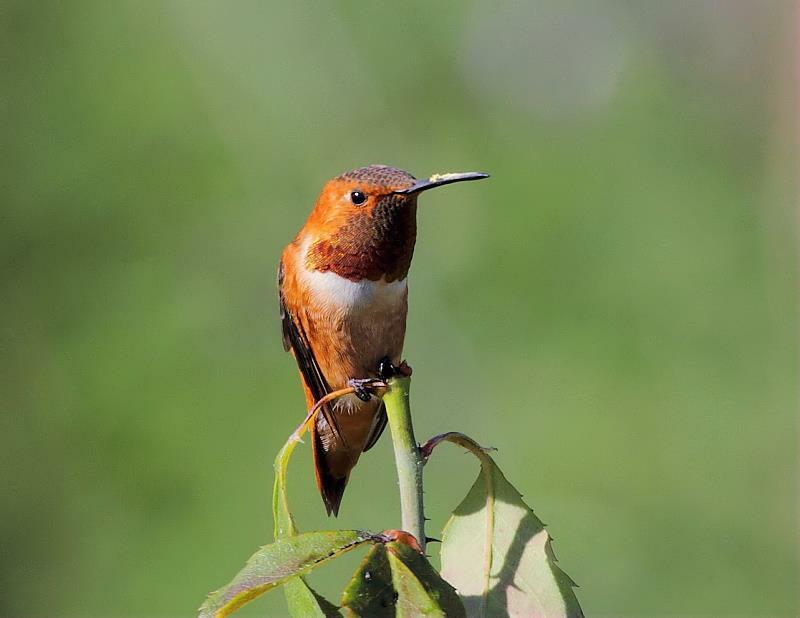 An average sized rufous hummingbird of about 3 inches makes one of the longest migrations for a bird of its size. The distance it travels is roughly 7,800 miles round trip. Being territorial, rufous hummingbirds have been known to chase chipmunks away from their nests. Due to their long migratory routes, they play an important role in pollinating various plant species in a wide area. Having watched the birds in my back yard for 45 years I was astounded to see the Rufous come to my phlox this August. The Ruby Throats were the accustomed visitiors. They were competing with the tiger swallow tail butterfly and a variety of bees.